Michelle Baumann is a world-class golfer and baker who just graduated from Creighton University. Since she is serving in Colorado, she is taking full advantage of the beautiful landscape by going hiking when she can. 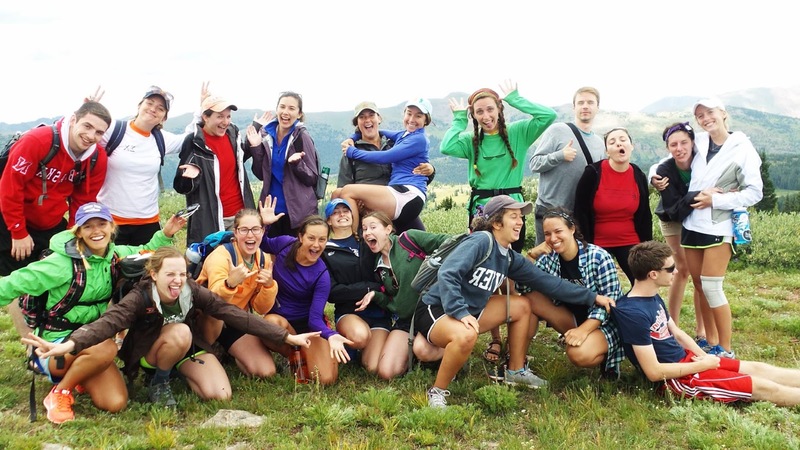 Read on to see what it’s like to begin a year of service with the Colorado Vincentian Volunteers! My name is Michelle Baumann and I am currently doing a year of service with the Colorado Vincentian Volunteers. CVV was started in 1995 by Bill and Mary Frances Jaster, who wanted to start a service program for young adults influenced by the spirituality of St. Vincent de Paul. CVV is a year-long program for up to 20 young adults interested in doing a year of service at a non-profit agency in Denver, CO. Each individual have the opportunity to choose which site he or she will work at based off of the interests of the volunteer. Some of the services sites this year include homeless shelters, urban gardens, elementary schools, refugee services, and day shelters. I chose to do a year of service because I know I want to go back to graduate school, but I am not sure if I want to get a Masters in Social Work or Counseling Psychology. I decided that I wanted to spend a year learning what it would be like to be a social worker to determine if that is the career path for me. This year, I am working at Urban Peak, a homeless shelter for at-risk and runaway youth. The shelter provides overnight services and case management for youth ages 15-20. At the shelter, I spend my time in two different positions. First, I am a Direct Care Counselor, in which I assist with meal services, laundry, answering phone calls, etc. My second position is a Shelter Case Manager, in which I assist youth with finding resources in Denver to help them accomplish their goals. Individuals in CVV live in an intentional community with the other members of CVV. We have two houses, so each house has 10 volunteers. As a part of the CVV community, activities are scheduled throughout the week to share and reflect on the experiences of the volunteers. I think the community event that is most significant for me and the most unique to CVV is the community dinner that happens on Monday nights. Every Monday, all of the volunteers leave work early to have “Reflection and Discussion” with the community. Topics for R&D include removing judgments and setting boundaries at work. After R&D, CVV has Mass together in the chapel in the CVV houses followed by dinner. Anyone in the Denver community is invited to attend Mass and dinner, usually totaling 25-30 people. Living in such a large community has taken some time to adjust to. With so many roommates and no homework, it always feels like something is going on, which is both good and bad. I love being able to go to common areas and usually find someone hanging out or playing a game. However, it can be difficult to take time for myself instead of spending time with my roommates. FOMO (or “Fear of Missing Out”) is something that I am adjusting to. It can be difficult to choose between spending quality time with my friends and spending time by myself to de-stress from the day. CVVolunteers are dedicated to living a simple life. Simple living includes using public transportation/biking, living off a stipend, living without wireless internet, and taking shorter showers. Prior to coming to CVV, I thought living simply meant giving up things so I could only live with things that are absolutely necessary. Now, I see it as choosing to live without excess in order to live in solidarity with the people we are serving. It is determining what things in my life are wants and what things are needs. Some aspects of simplicity have been a bigger adjustment than others. For example, two of the things that required getting used to were using public transportation/biking and living without wireless. Although I have only been in Denver for about 2 months, I am loving everything so far! I could not be happier with CVV and I am so thankful that I have chosen to spend a year here. Bill and Mary Frances, as well as the rest of the staff at CVV, are all wonderful people. All of them are so supportive and willing to help in any way they can. My volunteer experience would not be as wonderful as it is without my fellow CVVers. They are some of the most inspiring, dedicated, funny, and loving people I have ever met. I cherish the friendship I have with each one of them and I am so excited to see what the rest of the year has in store for us! To learn more about serving with CVV, click here!